Democratic institution building in and democratic governance of the security sector continue to pose challenges to all governments which have emerged from the former Soviet Union. Sustainable democratization, however, presupposes not only a general willingness and informedness, but also operational knowledge which can only come from democratic practice. European and Euro-Atlantic institutions have engaged Central Asia in a discourse on the comprehensive reform of state and societal institutions. The invitation to reform the security sector has as its objective an improvement of the security institutions and security-providing services as a change of the very ‘culture of security’. What is at stake is a shift from the ‘culture of state security’ to a ‘culture of cooperative security’, embedded in the Euro-Atlantic system. This again implies not only a process of insightful adaptation to Euro-Atlantic standards, norms and procedures. It also implies a process of ‘un-learning’ the past. Accountability - the construction of transparent lines of responsibility for each individual regardless of their position in government - will need to replace the expectation of collective responsibility. Parliamentary and public democratic oversight of the security sector budgets and personnel will need to replace the expectation that state security comes before individual security, and that budgets are therefore best kept secret and security-providing services best kept beyond the reach of parliamentary and public control. Civil-military relations with a strong accent on civilian political leadership structures within Ministries of Defence, and the successful integration of the General Staff within them, will have to replace the expectation that the military forms a state within the state. Civil society organizations will develop the sufficient competence and expertise to independently assess security sector governance, replacing the organizations that previously disseminated ideas to the public (for good or ill, as vested political interests dictated). Collective cooperative security, as provided by an alliance of sovereign states, will replace the expectation of a rigid system of artificially homogenized and integrated states and their militaries, as well as expectations of Darwinian battles of nation against nation. The concept of human security will replace the concept of security for one’s nation - or one’s office. 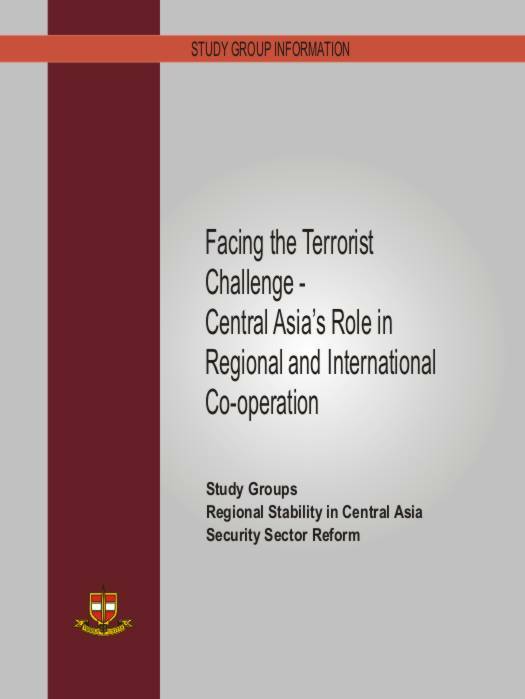 Though almost every Central Asian state is engaged to some degree in a discourse on security sector reform, democratic oversight of the security sector, and civil-military relations, it would be incorrect to assume that the joint efforts of European, Transatlantic, regional and national actors (including the media, civil society and academia) have led to homogenous or at least sustainable progress. The added challenge of joining the global coalition in the ‘fight against terrorism’ has accelerated development in some departments of the security sector. It has, however, at the same time led to a standstill if not a backlash in the evolution of a culture of human and civil rights, not to mention international humanitarian law. As security sector reform unfolds in Central Asia, human rights and will need to triumph over all supposed justifications to curb them. Security Sector Reform is not about making repression better.